This series, “Some Things Are Better In Black And White”, is an exploration into drawing organic forms on large pieces of Arches paper. Looking at the group so far, I could not imagine these pieces in anything other than black and white to reinforce the interaction and contrast between shapes. 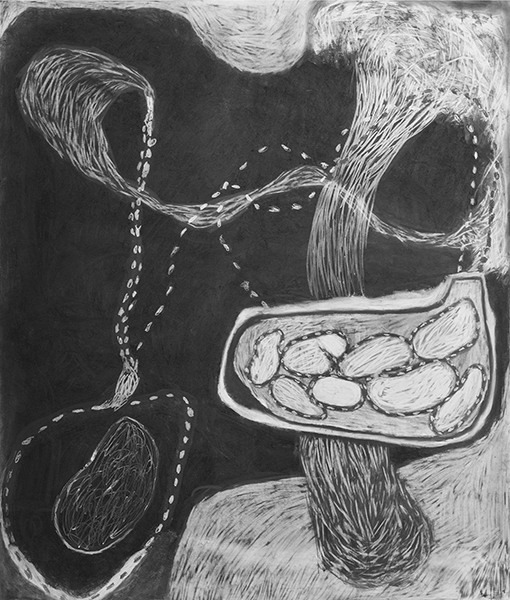 It is a search between a new visual language and techniques using the basic materials of drawing. I have limited myself to graphite, white pastel, white oil pastel, and white and grey Conte crayon. The only other rule I’ve set for myself is that all the forms must be connected in order to unify the composition. There is no agenda here other than my desire to freely explore drawing abstractly.